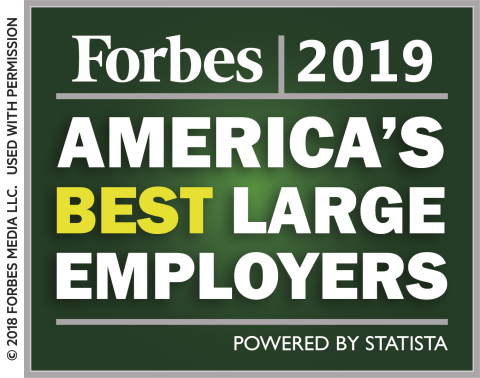 Lincoln Financial Group (NYSE:LNC) announced today that it has been named one of the Forbes America's Best Employers for 2019 in the Banking and Financial Services sector. This marks the third consecutive time that Lincoln Financial has achieved recognition on the list, which spotlights the top 500 large U.S. companies across 25 different industries. "We work hard to create an environment where all of our employees can grow and prosper," said Dennis Glass, president and CEO, Lincoln Financial Group. "This recognition is a testament to that work, and I am thankful to each and every employee at Lincoln Financial for their contributions to our success." Almost 30,000 employees at U.S. companies with at least 1,000 people were surveyed for the America's Best Employers List. Willingness to recommend one's own employer was considered to be one of the most important aspects of the survey. "At Lincoln, we have created an incredibly positive culture that values and rewards our approximately 11,000 employees throughout their career journey with us," said Lisa M. Buckingham, chief people, place and brand officer for Lincoln Financial Group. "Each and every day, we make a difference in people's lives by helping all Americans protect the ones they love, and our employees are the ones who are delivering on that promise. I'm so proud to work for a company that has such an awesome team—thank you to all of our employees for their many contributions that help differentiate Lincoln in the marketplace!" Some of the advantages of working for Lincoln Financial Group include a casual dress code, a commitment to diversity and inclusion, a generous 401k contribution and match, as well as a culture of giving through volunteerism, fundraisers and the Lincoln Financial Foundation, which donates $10 million annually. Please visit www.lincolnfinancial.com to review the company's complete list of benefits. Lincoln Financial's commitment to employees is further evidenced by its other recent awards like the Forbes Best Employers for Diversity for 2019 and Forbes Best Employers for Women 2018, a perfect score of 100 percent on the 2019 "Best Place to Work for LGBTQ Equality" and a perfect score on the 2018 Disability Equality Index®. Additionally, Lincoln Financial is a leader in corporate social responsibility. Click here to view the complete list of the Forbes 2019 Best Employers. This survey was independently conducted through global digital data collection partners and recruited respondents from thousands of sources to maximize reach and representation. Participation was voluntary and anonymous. In addition to detailed questions about working conditions, employees were asked to determine how likely they were to recommend their employer to someone else, as well as their feelings about other employers in their respective industries. The mix of respondents (gender, age, region, and ethnicity) in the sample represents American employees. In total, 1,000 employers have been awarded with 500 being large (over 5,000 employees) and 500 being mid-size. Lincoln Financial Group provides advice and solutions that help empower people to take charge of their financial lives with confidence and optimism. Today, more than 17 million customers trust our retirement, insurance and wealth protection expertise to help address their lifestyle, savings and income goals, as well as to guard against long-term care expenses. Headquartered in Radnor, Pennsylvania, Lincoln Financial Group is the marketing name for Lincoln National Corporation (NYSE:LNC) and its affiliates. The company had $238 billion in assets under management as of December 31, 2018. Lincoln Financial Group is a committed corporate citizen and was named one of the Forbes Best Employers for 2018, is a member of the Dow Jones Sustainability Index North America, and received a perfect score of 100 percent on the 2018 Corporate Equality Index. Learn more at: www.LincolnFinancial.com. Follow us on Facebook, Twitter, LinkedIn, and Instagram. Sign up for email alerts at http://newsroom.lfg.com.